Cauda Equina Syndrome is a rare but serious form of spinal cord injury related to the compression of nerve roots (cauda equina) in the lower portion of the spinal canal. Spinal cord injuries such as CES can happen in many different ways. No matter how the injury occurs, though, quick diagnosis is critical to preventing permanent damage. 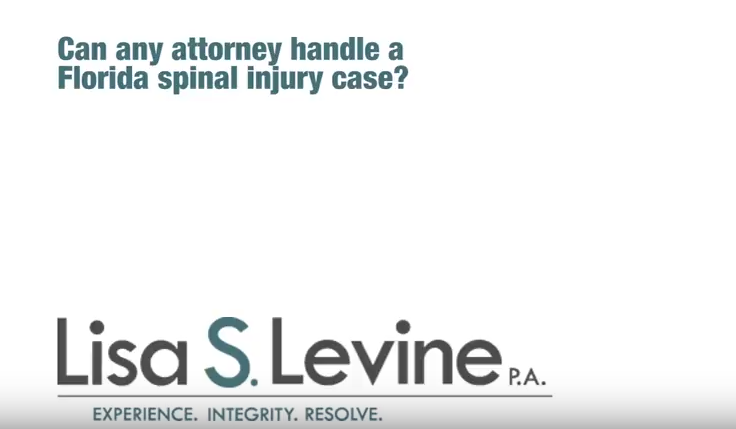 As a Florida medical malpractice attorney, Lisa S. Levine, PA, helps clients who have suffered through this condition as the result of as the result of negligence by a doctor or other medical professional. This negligence can include a failure to diagnose and treat a patient correctly or a failure to correctly perform a medical procedure. 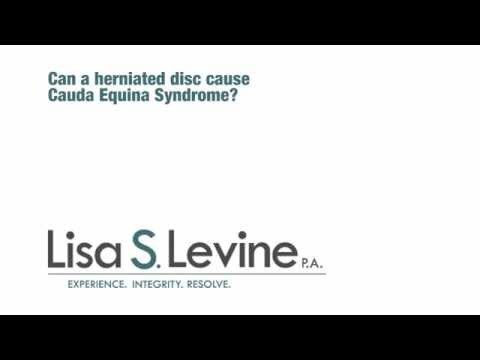 What Are Some Causes of Cauda Equina Syndrome? Lumbar epidural injections can be a very effective means of managing lower back pain when properly administered by an anesthesiologist. 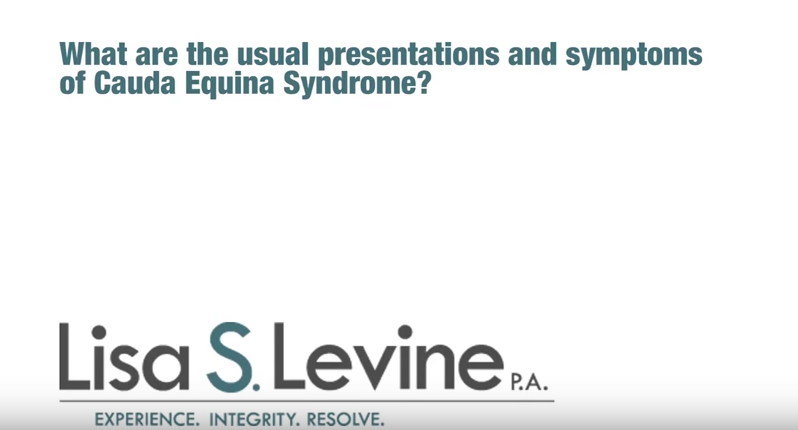 When not performed properly, however, the procedure can lead to permanent and serious injury, including Cauda Equina Syndrome. 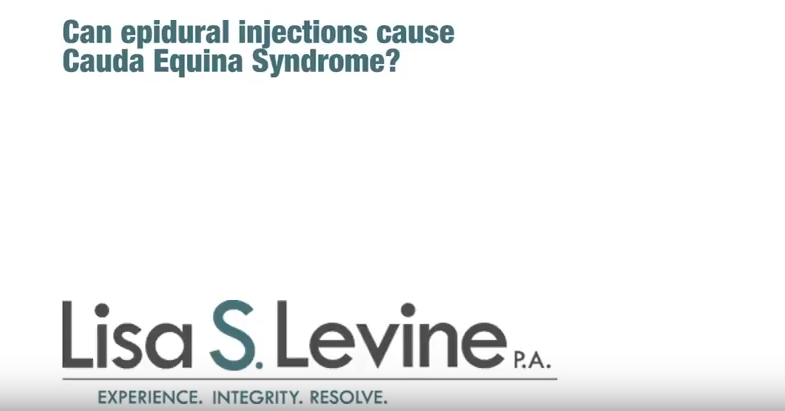 The injections can cause injuries when the needle isn’t place into the right level, or the material being injected causes compression to the cauda equina nerve that isn’t noticed or evacuated in a timely fashion. Another of the causes of Cauda Equina Syndrome is related to complications from spinal surgery, including a post-operative hematoma. This refers to the localized collection of blood outside the blood vessels, usually within the tissue. A patient may be doing well after surgery then suddenly become unable to urinate or have a bowel movement, or experience numbness or tingling. This can be an indicator of Cauda Equina Syndrome related to post-operative hematoma. 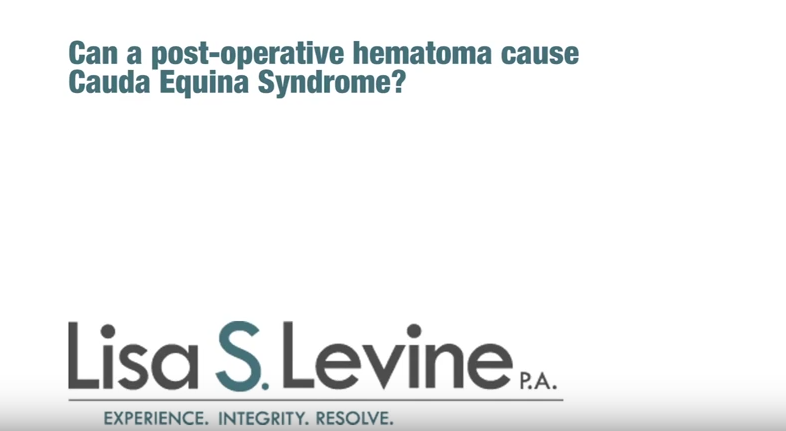 While the development of a post-operative hematoma is not necessarily the result of negligence, if your doctor fails to diagnose and treat the condition in a timely manner, it can be a mistake that causes patients serious harm. A herniated disc refers to a medical problem with the cushions between vertebrae that help form the spine. If a disc herniation leads to Cauda Equina Syndrome, there is a very short window of time for medical staff to address the problem. If your doctor fails to accurately assess the causes of Cauda Equina Syndrome and provide treatment, or if you suffer the condition after an improperly performed procedure, you may be entitled to financial compensation. 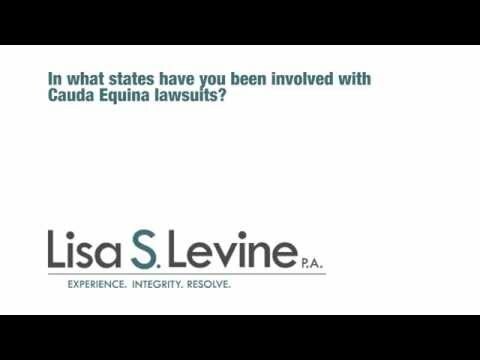 Lisa S. Levine, PA, is a nationwide expert in CES cases and a Cauda Equina Syndrome litigation attorney in Florida. She has handled and consulted on more than 60 cases across the U.S., including in New Jersey, Utah, California, Wisconsin, Florida, Alabama, Georgia, Louisiana, New York and Texas. In Florida, she has helped CES patients throughout the state, including in Fort Lauderdale, West Palm Beach, Miami, Tampa, Orlando and Ocala. Call (954) 256-1820 today to schedule a free consultation and get the help you deserve.